Wrapping up work on CondomCorps this week. 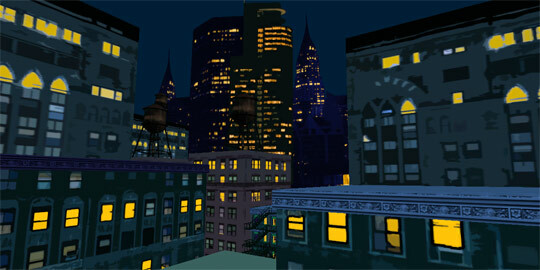 The color palette is heavily inspired by the "Benten" levels of Jet Set Radio, as those levels always felt the most "urban" to me. But if we're talking about urbanness, then "what is a city without its people?" The pedestrians on the sidewalks are particles, but obviously particles -- so I think they're actually less conspicuous than, say, the animated runner sprites in Mass Effect 3 skyboxes. To me, that's what most video games get wrong about cities: they are utterly crowded things. 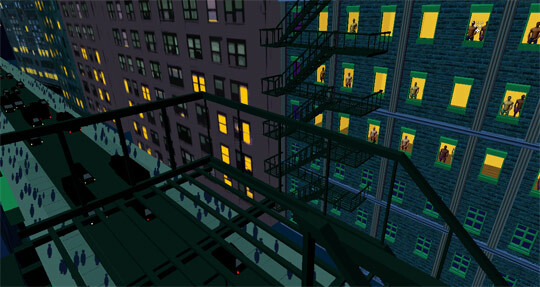 "Different Games" at NYU-Poly, April 26-27 2013. Dreamlab: VR research at Parsons.